Best Achievement for Argyll An organisation, a person, an event or a website -- who or what has made the biggest to our region this year, and why? I don't think I need to explain the Islay Energy Trust, most people will be aware of what they've done to put Islay in the worldwide spotlight. Gets my vote. The other one embarrasses me a bit for it is this blog. My hobby as a best achievement? I must admit I'm struggling a bit with that. Not to forget that the comment in the nominations update painfully reminds me that the 5th edition of the printable Islay guide (PDF) is several months overdue. Best Tourism Initiative What company, individual or organisation has made, in your opinion, the biggest impact in the field of tourism in the last 12 months, and why? Not strictly speaking an Islay nomination, but Jura is close enough, so the Jura Passenger Ferry is a great candidate. In particular with the potential funding problems I think this nomination could help securing the service. Best Environmental Initiative Be it a community project, a council policy or personal mission what initiative, in your view, has made the biggest contribution to the greening of Argyll, and why? I think the Islay Energy Trust with the Islay tidal energy project is self explanatory. Islay Birding for going car free is the other nomination. Best Community Initiative The communities of Argyll have had a tremendous year this year, taking all sorts of ideas from the drawing board to fruition. Which initiative has most impressed you, and why? I don't know enough about Finlaggan and the associated projects, but from the little I do know and pictures I've seen from the opening day they certainly had a great year. The Port Ellen Primary School with their Brilliant Beginnings blog have done some great work this year. Come to think of it, shouldn't this also go under the best environmental initiative? Best Homecoming Event 2009 was the year Scotland invited everyone to come home, and Argyll was one of the three regions to Really Get Homecoming. Which event or project in Argyll really got homecoming for you, and why? I didn't attend it, but I'm sure the joint concert of the Glasgow Islay Choir and Coisir Ghaidhlig Ile was a great event. There are a number of videos and pictures on the internet, the Islay Festival & Homecoming Parade I think are an excellent candidate, in particular for featuring the emergency services. Best Major Event Every year Argyll hosts more and more significant events, and this year was no different. Which one did you enjoy the most, and why? This is the most tricky one for me, as I can think of several from personal experience. I can fully agree to the comment on Walk Islay: ‘8 years old and like a big party meeting up with friends from years past and new visitors and the walks are all led by island people’ Couldn't have said it better. Again thinking about it, wouldn't this be a worthy candidate for the best achievement category? This year I visited the Islay Beach Rugby tournament for the first time. I enjoyed it so much that I'm planning next years summer holiday around it. The Islay Festival / Feis Ile is probably the event Islay is best known for. Not listed yet (although I hope I can change that soon) is the Education2020 Unconference 2009 on Islay. Admittedly it was a bit of a specialist event (but then so were the others) and not as recognised in the ‘press’ as I think it should have been, but as far as I can tell both the event and the work done at Islay High School is recognised all over Scotland and even the UK. Best Community Event Community events are an essential part of the life of Argyll, and give communities a chance to put themselves on the map. For 2009 which community-led event most impressed you, and why? The Islay Bards evening at Ionad Chaluim Chille Ile sounds like a great community event to me. The Islay Beach Rugby has already been mentioned, it's a big event yet also has a community feel to it. Best Arts Programme Year after year Arts and Culture prove themselves to be the lifeblood of Argyll, providing entertainment for locals and visitors alike. Which Arts Event had the best programme in Argyll this year? The Islay Pipe Band managed to overcome their financial problems earlier in the year, were successful in their new grade and have just launched a second band. Enough said. I would like to add the Islay Book Festival. While I haven't been to one (yet) they seem to be able to attract good authors and writers every year. Best Activity Website Argyll is a region boasting a multitude of things to do. Which website promotes an activity, or activities best? Jez Hastings' Islay Wilderness Guide has won various awards, so that should certainly qualify. Same applies to Islay Birding. The Islay Sea Shipping Blog by Elliott seems a worthy candidate to me, certainly for all the ship spotters! Best Wildlife Website One of the glories of Argyll is its flora and fauna – which website pays tribute to our wildlife best? I've already mentioned in in the first ideas, I think the Islay Birds blog is a very worthy contender here. Updated regularly with news and pictures from many contributors under Ian Brooke's coordination. The competition comes from Islay Birding again. Best Community Website The internet is now the pre-eminent tool for communities to get their message across, to communicate with residents and to encourage visitors – which community website has most impressed you in the last 12 months? Best Local Newspaper Argyll is blessed with several active local newspapers providing essential services to the population, but which one has impressed you most this year? I think that's obvious: The Ileach. And that's it. You've made it all the way to the end. 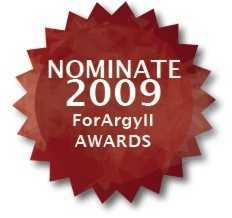 Now that you've got this far you should go to the nominations for the 2009 ForArgyll Awards page and submit your nominations. You've got until 23:59 hours on Wednesday 23/Dec to get them in. Better don't wait too long!